Fit Plus Wear Review — MommiesRun. I think by now y'all know that I have a thing for running clothes. I basically live in either scrubs or running gear, so I'm pretty sure I have become quite the expert. 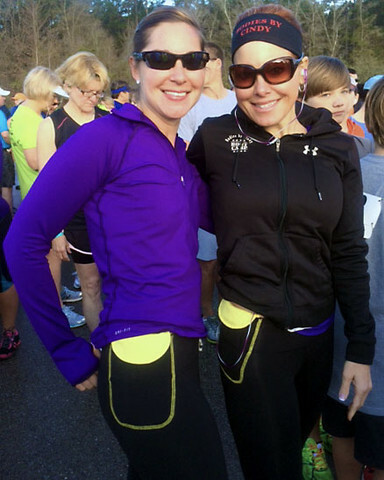 So it's no surprise that I jumped at the chance to try a new and innovative pair of running capris from Fit Plus Wear! The first time I wore my capris was on a run around my neighborhood. I simply slid my phone into the pocket and took off. The thing that impressed me immediately about the capris was that I forgot my phone was in my pocket. It truly did not bounce or budge. You know what else didn't budge? The capris themselves! A big reason why I never wear capris is because they are constantly falling down on my waist. There is nothing more annoying to me than messing with my clothes as I'm running. But I had none of that with Fit Plus Wear. I also loved the compressive feeling that they provided. My legs felt hugged, and I imagined them being super supportive for a long run or even a marathon. Now because I'm a mom, and you know moms wear workout clothes every where, I decided to wear my capris on a non-running adventure to a race expo. This was no ordinary race expo....this was a race expo in 90 degree heat. While I found myself dripping with sweat, I didn't notice any extra sweat or uncomfort from the capris. What? In fact, my legs felt quite awesome. This is a huge win in my book. Fit Plus Wear comes from the brilliant minds and hearts of Cindy and Heather, two women that wanted to create a line that would keep their health in mind. Cindy lives with rheumatoid arthritis and lupus, and Heather has had 3 knee surgeries. Therefore, they wanted to create capris that would support their joints and keep them comfortable. I think they found success! At $88 a pair, I realize these might be a little pricey. But when you compare the style and quality to some other brands that rhyme with mumumemon, they are right on point. Plus, why not support a product made in the United States, that even (gasp!) has sizes up to 3XL! Not knocking that other company, just saying women have hips, yo. I can't wait for the weather to cool down so that I can wear these capris on more runs. Until then, don't be surprised to find me walking up and down the aisles of Kroger dropping the produce and organics in my cart, looking fly. And if you are looking for a fitness clothing model, look no further. Here's the exciting part, Cindy and Heather have graciously provided a discount code for YOU to use to get 20% off ANY Fit Plus Wear clothes. Just use 2HE90CGR5Y4U and shop away! I was provided with a pair of Fit Plus Wear capris in exchange for a review. As always on MommiesRun, all opinions are my own and you know I keep it real.